The first of our Knox Bro's. specialty seasonings, Kabob middle eastern market style seasoning. 'Kabab' in the Middle East means meat cooked over or near a flame. Typically bite size pieces of meat and traditionally lamb. "Shish' is a skewer. Shish Kabab, or Kabob (as we say here in the states), is meat grilled on a stick. There you have it, get cooking. If you have a shish or not our middle eastern kabob seasoning will bring exotic, robust and aromatic flavor to grilled meats, primarily lamb, chicken, pork and beef. We feel it is a little heavy handed for fish but you can decide for yourself. 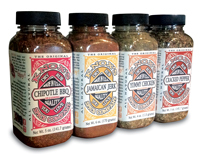 Keeping with our all natural tradition our seasoning has NO artificial flavors, fillers or colors. Only aromatic and tasty herbs and spices for a Middle Eastern flavor you will enjoy. To get the most of our seasoning make sure you rinse fresh meat and dry off excess moisture. You can cut into bite size pieces and skewer or prepare as you normally would. Season meat by sprinkling our middle eastern market style Kabob seasoning in an even layer on all sides. Allow to marinate in the refrigerator until ready to grill or grill immediately. Blended from some of the most flavorful and aromatic herbs and spices of the region (as well as some of the most expensive) and excellent on chicken, lamb, pork and beef. A great blend of cumin, cardamom, allspice, coriander, clove, black pepper, red pepper, ginger, turmeric, salt, paprika and cinnamon. The combination becomes a flavor in itself and one that certainly will remind you of the tastes and smells of middle eastern cuisine. 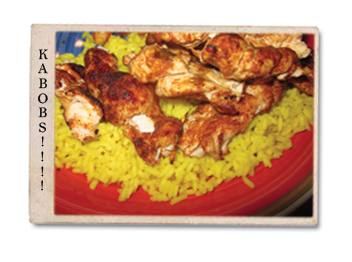 We recommend it on chicken shish kabobs that are cooked over a grill. Use lump hardwood charcoal for best results, mesquite is better. Whatever you decide to season, be it chicken, pork, lamb, cobrito (goat) or beef, always dry and apply just a little olive oil, butter or vegetable oil before seasoning to aid in cooking and the infusion of flavor. We also suggest allowing the seasoning marinade in the refrigerator for at least 30 minutes. You can grill directly after adding Knox Bro's. Kabob Seasoning as well as adding just a touch just before serving.